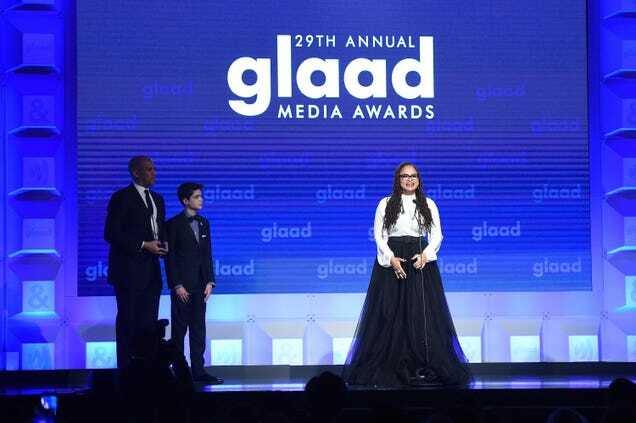 Director Ava DuVernay accepts the Excellence in Media Award onstage at the 29th Annual GLAAD Media Awards at the Hilton Midtown in New York City on May 5, 2018. “I chose to protect my family from ignorance. I was happy, but I was not free,” said Carter at the 29th Annual GLAAD Media Awards in New York City on Saturday. Carter, whose youngest son is rapper Shawn “Jay-Z” Carter, received the Special Recognition Award for her coming-out story on “Smile”—by now, you’ve likely heard the song on Jay-Z’s Grammy-nominated album 4:44. That evening, Carter shared the stage with other phenomenal black women, including Laverne Cox, Blair Imani and The Root 100 honoree Yamiche Alcindor. Truth be told, The Root was there to cheer on the black women. Sorry, not sorry. Among the sistren was Samira Wiley, who took home the Vito Russo Award. The Handmaid’s Tale actress says that her coming out was a bit easier. Wiley—who had the opportunity to portray two queer characters on television—came out to her parents in May 2008. And finally, there was the Excellence in Media Award. Sen. Cory Booker (D-N.J.)—who lent his voice to DuVernay’s Peabody Award-winning documentary, 13th—presented the history-making director with the award on Saturday. Booker stood onstage, awed (as was the entire audience), as DuVernay gave her speech. “People ask me a lot about being an activist and an artist, and to me they’re one and the same. To be an activist, one must be highly creative. It takes great imagination to envision a world in a way that’s not there,” DuVernay said. DuVernay, through her work as a director and founder of Array, provides space for the stories of LGBTQ people to exist. Notably, the character of Toine Wilkins, played by Brian Michael Smith, on Queen Sugar is a black transgender man, depicted by a black trans man. Platforms to tell these stories, and a diversity of characters, are much needed in a world that favors a patriarchal system of whiteness. So speak up. Speak loudly, speak often and speak out to advocate for those in the shadows. Because as black people, we are no strangers to discrimination and subjugation. We know all too well that life without freedom is no life at all.